A country estate on Nelder Creek! Ideal private location on 5.47 acres between Bass Lake and Oakhurst. This home has a large deck and large spa, "all" overlooking the creek! Hear and see the running water to totally relax you. The home is state of the art 3722SF featuring 5 bedrooms, 4 baths, vaulted ceiling, wood & ceramic tile floors, a great room concept and a separate recreation room. The kitchen is incredible with all stainless steel appliances, ice maker, wine cooler and country style farm sink. A lA country estate on Nelder Creek! 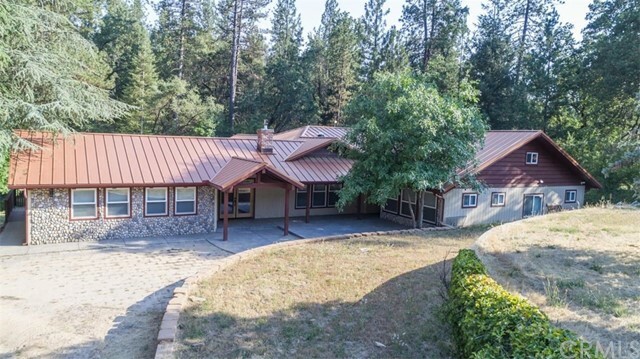 Ideal private location on 5.47 acres between Bass Lake and Oakhurst. This home has a large deck and large spa, "all" overlooking the creek! Hear and see the running water to totally relax you. The home is state of the art 3722SF featuring 5 bedrooms, 4 baths, vaulted ceiling, wood & ceramic tile floors, a great room concept and a separate recreation room. The kitchen is incredible with all stainless steel appliances, ice maker, wine cooler and country style farm sink. A large separate 4 car garage, enough to park 7 cars depending on their size. Located among pines, oaks and cedars @ approx. 3000 elevation. Living the good life!! By Appt. only. Beds & baths are different than county records. Buyer to verify if concerned.